If you are interested in converting to a walk-in shower in your home, Infinity Home Improvement can help. 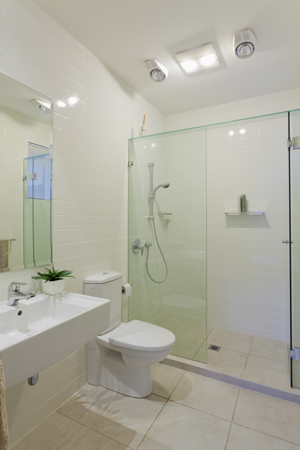 We can transform your bathroom into a safer, more comfortable space that allows you easier use. We also offer a variety of other bath and shower services including shower enclosures, bathtub & shower surrounds, walk-in tubs, and bathtub liners. Call us today at 1-844-329-3277 to get a free estimate! We serve Grand Rapids, Kentwood, Wyoming, and nearby! "Excellent! Very prompt. Makes customer feel at..."
Cutting an opening in the tub apron: Instead of tearing out a tub that's in reasonably good condition, it's possible to cut an opening in the tub wall (apron) and create a shower with safer, easier access. We will use special cutting equipment to create an opening in the tub wall, then reinforce and finish the cutout area with specially made filler pieces, caulk, and other proprietary materials. A shower curtain or a specially made glass shower door can be installed to keep water inside the tub. Replacing the tub with a shower base: One benefit you don't enjoy with option #1 is a larger showering area, as you're still stuck with the limited space of the tub floor. If you replace the tub with a new shower base sized to match the tub, your showering area changes from cramped to very generous. For this kind of conversion, it is often recommended that a new shower surround is installed to go with the new shower base. This type of surround can be installed directly over an existing tile wall, saving time and money. Since the surround is durable and completely waterproof, there will be no grout joints to clean or repair. To complete any tub to shower conversion, it's worth adding in a few extras that will enhance safety, convenience, and your overall enjoyment of this transformed space. Adding grab bars in your new shower space will make it safer and more user-friendly for people of all ages. It's also a good idea to install a new mixing valve for the shower. The valve and its temperature control handle can be located at a convenient height on the shower wall. Finally, don't forget to upgrade to a full-featured showerhead. If you're looking to upgrade your bathroom with a tub to shower conversion, Infinity Home Improvement is happy to help. Give us a call or contact us online for a FREE quote! We provide free estimates for all our services in Wyoming, Kentwood, Grand Rapids, Rockford, Allendale, Walkerville, Holland, Battle Creek, Kalamazoo, Lansing, and throughout the surrounding areas.